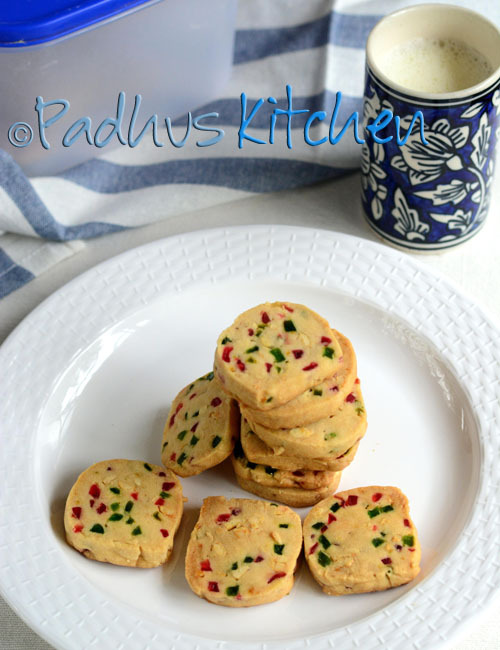 Tutti Frutti Cookies/Fruit Biscuits are quite addictive and make a perfect tea time snack. I love karachi biscuits very much and wanted to try it at home. I happen to stumbled upon the recipe at cafegarima. I will not say that these cookies tasted exactly like karachi bakery fruit biscuits but they were no doubt, very delicious. Today we will learn how to make eggless tutti frutti cookies following this easy recipe with step wise pictures. Bring butter to room temperature. Chop cashew nut into small pieces. Sieve maida with salt and keep it ready. Powder sugar and keep it aside. Add chopped cashew nuts, vanilla essence, orange zest and tutti frutti. Mix well with a spatula. Add flour and make a dough. Mold it into a cylinder or cuboid. The dough will be very soft. If you are unable to mold it, refrigerate for 10 minutes and then mold it. Suppose if the dough is crumbly, you can add a little milk. Wrap it in a butter paper or cling wrap and refrigerate again for 1 1/2 - 2 hours. Take the dough from the refrigerator and cut it into slices 3/4 cm thickness. Arrange the slices in parchment paper lined tray leaving enough space between the cookies and bake in a pre-heated oven at 180 degree C for 20 minutes or until the edges starts to brown. Cool it over a wire rack and enjoy. The cookies will be soft once you take out of the oven. As it cools it will be perfect. Storage and shelf life - Store it in an airtight container at room temperature. Stays good for a week. Preeti - I have written under "Preparation". Read the third line. You have to preheat the oven. Can we do this in microwave oven - convection mode? Will it turn out perfect? I am not sure as I bake only in OTG oven. Hii padhu is there any replacement for Orange zest?? You can skip that. No replacement for that. It only adds to the flavor. After taking the dough from the refrigerator, you have to work quickly otherwise the dough will become soft. Or else you can divide the dough into 2 equal parts and refrigerate it. After finishing one batch, you can take the one from the refrigerator and continue. Thank you for the recipe,I have followed all your direction but it came out little soft,may be thick Ness not enough also the shape is not square after baking it melted and spread. Is it possible to make this with a mix of atta flour and maida or completely atta? if so, do I need to change proportions or add anything more? Yes, you can. You do not have to change the proportions. Yes, you are right. Refrigerate means not freezing. I will mention specifically if it has to be freezed. Nice thanks, your recipe was really simple and the cookies turned out just perfect. Wow.It really looks yummy yummy. i'm gonna try it out dis weekend. can we bake these biscuits in cooker like u've mentioned in another biscuit recipe? r it needs to be done nly wit oven. cuz i always smehw burn things wen i use oven. also i wanna kw which maida brand is good for cooking biscuits.